So it shouldn't have been a surprise when we got a phone call late last week from Kenny from Highland band Torridon asking if we could help out with their idea to release a single to mark Ross County's historic Scottish Cup Final appearance at Hampden next month. Of course when we're asked to do these things the brain tells you to hang up, the heart however tells you that this is why you're in this business and not in banking. It's about taking some time out to smell the roses and just enjoy the project to the full. So yes it was and since yesterday morning we've been finalising details with the venue - The Ironworks in Inverness; we've sorted out the sound recording with Dingwall based Highland Backline; met with The Sun discuss some promotional opportunities; discussed the lyrics with the band and hopefully have finalised a distribution deal for the proposed launch of the single on 10th of May. It's great fun, not perhaps a day to day occurence but it's great to be involved in, absorbing, challenging and requires us to be able to think quickly, adapt, adopt and decide at on the spot. We'll keep you up to date with the progress of the song which is being recorded live in Inverness on Tuesday 27th April. We're always banging on about Social Media requiring purpose or it's not worth doing. It must achieve an objective, develop brand, create revenue, reduce costs. Something other than finding pink animals in a neighbour's farm or sitting down for another glass of wine! Anyway, the ability of social media to communicate quickly is truly amazing. 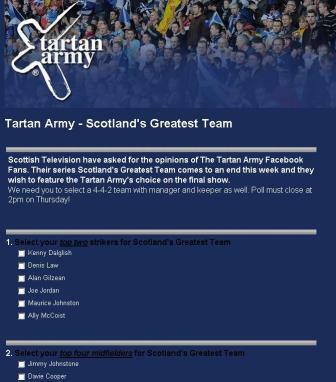 As part of our management on online marketing for The Tartan Army, we are always dealing with media requests for something or another about The Tartan Army's opinions or actions; so it was no real surprise to be approached by Scottish Television this morning with a request for a Tartan Army spin on Scotland's Greatest Team - a programme finishing this week with votes on who should play in a 4-4-2 team. 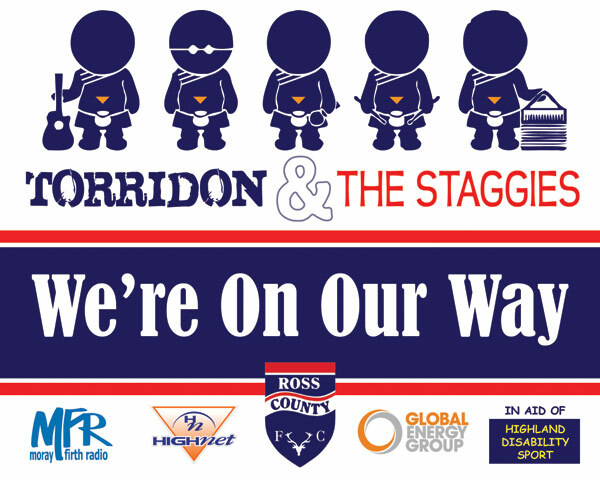 So rather than giving them a single opinion we've put together a ConstantContact Questionnaire online and driven it through the Tartan Army facebook page which The Edge set up for them. The results will be collated real time online and sent in spreadhseet form to STV pre broadcast. Now you can imagine how online polls could benefit your business' customer care. We noted with some interest that Jaermann & Stübi has become the official clock supplier and timekeeper of Scottish golf course St Andrews Links, and has created a limited-edition to watch to mark the occasion. According to the press copy, "Jaermann & Stübi has created 18 platinum watches as part of The Old Course collection; each watch is dedicated to a hole on the famous golf course and is inscribed with statistics about the hole it represents." Unfortunately we're unable to advise you on how much the watches may be but may be more expensive than an Old Course Experience four ball but cheaper than an apartment overlooking the eighteenth!